This is a film for Scots, and, as an Englishman, I have to announce that upfront. Directed by Charles Martin Smith, it recounts the true story of the robbery of the the Stone of Scone from Westminster Abbey in 1950 by Scottish nationalist Ian Hamilton (Charlie Cox). Known as the Stone of Destiny or Coronation Stone, it historically was used during the crowning of Scottish Kings and resided at the now ruined Scone Abbey. In 1296 the stone was captured by King Edward I and subsequently incorporated into the Coronation Chair used by English kings/queens since. 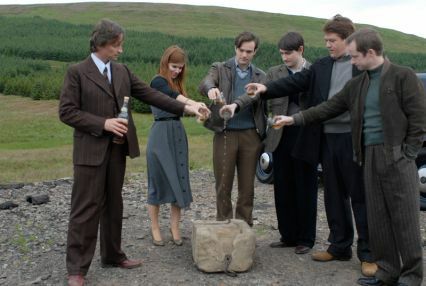 The film is a too-long-drawn-out retelling of its emancipation from the English and its return to Scotland. Seems Director Smith wanted to give us every blessed moment of the journey which, let me tell you, makes for a lot of boredom. The film's utter monotony is only made bearable thanks to Robbie Carlyle's presence as John MacCormick, who helps to finance the theft. Stone of Destiny will appeal to any Scot in the house and reinforces to us English the fact we shouldn't have bothered conquering their sorry arses in the first place. My rating, with a yawn, 5 out of 10.